In The Republican Noise Machine, David Brock skillfully documents perhaps the most important but least understood political development of the last thirty years: how the Republican Right has won political power and hijacked public discourse in the United States. Wrapped in the Flag chronicles the radical right wing world of the 1960s when conspiracy ruled and the John Birch Society made national headlines. The daughter of a John Birch Society leader, Claire introduces us to the extreme ideas of a powerful political fringe group dispensing radical solutions to America’s problems. Noam Chomsky’s backpocket classic on wartime propaganda and opinion control begins by asserting two models of democracy—one in which the public actively participates, and one in which the public is manipulated and controlled. The term 'brainwashing' was first recorded in 1950, but it is an expression of a much older concept: the forcible and full-scale alteration of a person's beliefs. Over the past 50 years the term has crept into popular culture, served as a topic for jokes, frightened the public in media headlines, and slandered innumerable people and institutions. It has also been the subject of learned discussion from many angles: history, sociology, psychology, psychotherapy, and marketing. Despite this variety, to date there has been one angle missing: any serious reference to real brains. 7. "The Way Things Aren't: Rush Limbaugh's Reign of Terror" by FAIR"
The Way Things Aren’t documents and corrects over 100 whoppers told by The Lyin’ King, pitting Limbaugh versus Reality in areas ranging from American history to the environment, health care to rock and roll. It also has features such as “Limbaugh versus Limbaugh” with examples of Limbaugh contradicting himself, cartoons by Garry Trudeau and Tom Tomorrow, seven things you can do about Rush Limbaugh, a postcard to mail to the talk show host about his Limbecile statements, and a foreword to Limbaughland by Molly Ivins that is as scary as it is funny. The Fox Effect follows the career of Ailes from his early work as a television producer and media consultant for Richard Nixon, Ronald Reagan, and George H. W. Bush. Consequently, when he was hired in 1996 as the president of Rupert Murdoch’s flagship conservative cable news network, Ailes had little journalism experience, but brought to the job the mindset of a political operative. As Brock and Rabin-Havt demonstrate through numerous examples, Ailes used his extraordinary power and influence to spread a partisan political agenda that is at odds with long-established, widely held standards of fairness and objectivity in news reporting. A timely cannon blast at the right-wing media machine and how it subverts the principles of democratic representation. Why are Americans so vulnerable to divisive political tactics? Why did Americans get dragged into such an unwise war in Iraq? Why do fundamentalist religious groups, Fox News, and right-wing radio still play such influential roles in America’s political landscape? And why are long-accepted rational scientific ideas like evolution under siege? These questions hold America’s future in the balance. Ultimately, they are questions about the American mind. Psychologist-attorney Dr. Bryant Welch has the answers. Rupert Murdoch's recent multibillion-dollar purchase of the Wall Street Journal made international news. Yet it is but one more chapter in an untold story: the rise of an integrated conservative media machine that all began with Rush Limbaugh in the 1980s. Think tanks are nonprofit policy research organizations that provide analysis and expertise to influence policymakers. From the 1970s their number exploded in the U.S. and their proliferation represented a hope that lawmaking might become better informed and more effective as a result of these expert contributions. Instead, as this book documents, the known ideologies of many, especially the newer, think tanks currently contribute to an environment in which they differ little from advocacy organizations, promoting points of view and preordained policy prescriptions. As a result, they fail to achieve desired influence and undermine their credibility. Hassan describes the identifying factors of being in a cult and then offers help to people who want to help others emerge from 'thought reform' and mind control. In today’s post-truth political landscape, there is a carefully concealed but ever-growing industry of organized misinformation that exits to create and disseminate lies in the service of political agendas. It has crippled legislative progress on issues including tobacco regulation, public heal care, climate change, gun control etc. 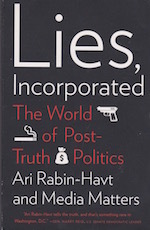 Lies, Incorporated takes an unflinching look at the the powerful network of politicians and special interest groups that have launched coordinated assaults on the truth to shape American politics.